What is Ghee? & How can I make Ghee? Some of our friends and family are wondering what Ghee is and how they can prepare it at home, so we thought it would be both interesting and fun to write a post about it. Ghee is Sanskrit for clarified butter. It is basically butter that has the milk solids and water removed. It is primarily used in Indian cuisine and in some Middle Eastern dishes. Ghee has a wonderfully sweet and nutty flavor, and a very high heating point. Traditionally it was used in the Indian cuisine for deep-frying, until refined vegetable oil was introduced as mainstream cooking oil. Ghee, however, is gaining increasing popularity among primal living and health food advocates. Ghee is made by bringing unsalted butter (use organic) to a boil (use a saucepan or small sauce pot), until the water has boiled off and the protein has settled to the bottom. Reduce the heat and simmer until it turns a clear golden color. You’ll know when the ghee is done, because you will be able to see the white frothy foam on the surface. Let it cool for 30 minutes, then sieve it using a stainless steel mesh strainer or cheese cloth. 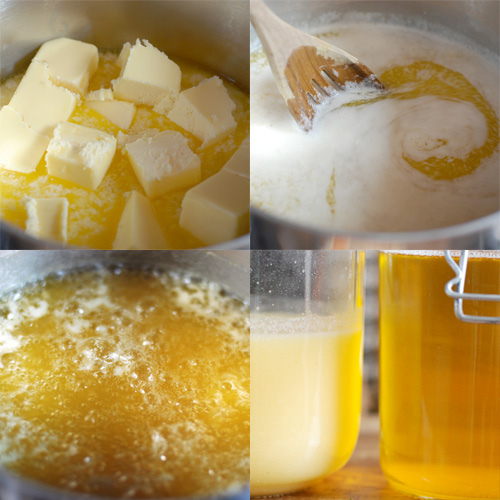 Transfer the ghee to a glass jar and seal it tightly to avoid exposure to moisture. It can be stored without refrigeration for several months. Ghee does not have hydrogenated oils and is a popular choice for us health conscious folks. Since all the milk proteins have been removed due to the clarifying process, ghee’s become lactose free, making it an attractive alternative for those of you who are lactose intolerant. Most importantly it is said to stimulate the secretion of stomach acids to help with digestion, while other fats, such as butter and oils, slow down the digestive process. It has long been used in the Indian culture to help with ulcers, constipation, and the promotion of healthy eyes and skin. For thousands of years Indian folk remedy has claimed to promote learning abilities and increased memory retention. Finally, ghee has a high concentration of butyric acid, a fatty acid that contains anti-viral properties. It is believed that it can help to inhibit the growth of cancerous cells. 20 replies to What is Ghee? & How can I make Ghee? iphone during lunch break. I love tthe info you provide here and can’t wait to take a look when I get home. puone .. I’m not even using WIFI, just 3G .. Anyways, great site! basis, this website is in fact nice and the people are actually sharing nice thoughts.